The host Russians gave a full effort at the Ice Palace, but Finland’s team play was superior once again. Finland, which has a perfect record with nine straight regulation victories, will face the winner of the Canada-U.S. semi-final for gold on Sunday night. Finnish starting goalie Mikko Koskinen out-dueled Russia’s Sergei Bobrovsky. Shots on goal favored Russia 29-16. Saturday’s early semi-final also had overtones of the 2007 semis when Finland shocked Russia 2-1 on Mikko Koivu’s overtime goal, dealing the host nation its first defeat on Moscow ice in World Championship history. They’re one win away from achieving the unprecedented feat of capturing World Junior, U18, and World Championship gold in the same year. Jalonen’s team blanked the top Russian trio of tournament scoring leader Vadim Shipachyov (16 points), Artemi Panarin (12 points), and Yevgeni Dadonov (11 points). Meanwhile, Finnish leaders Laine and Mikael Granlund, who entered with 11 points apiece, both chipped in assists in the semi-final. “The key was that they scored on the power play and we didn’t,” added Kuznetsov. After the Finns got through a tough first period, their defense-first approach staved off Russia’s flashy, frenetic attack. The Ice Palace was fired up with “Shaibu!” chants from the partisan crowd of 12,215, and coach Oleg Znarok’s squad got the start it wanted. Ivan Telegin came off the side boards and backhanded a pass to Shirokov, who fired a quick shot on goal and slipped between the Finnish defense to bang the rebound past Koskinen at 2:52. 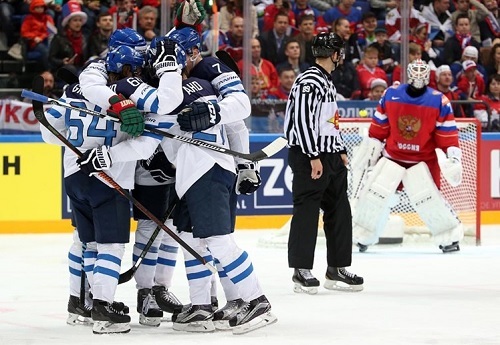 The Finns didn’t get a shot on goal for more than 11 minutes, and were outshot 10-4 in the opening stanza. Koskinen slid across to make a fine save on an onrushing Dadonov near the eight-minute mark. Barkov returned to the Finnish lineup after missing the 5-1 quarter-final win over Denmark with the flu. During Finland’s opening power play, Barkov came close to equalizing on a great chance by the right post. “We might have come out with a little too much respect for them in the beginning, but we relaxed a little and played better the rest of the game,” said Komarov. Alexei Marchenko went off for hauling down Leo Komarov in the Russian zone, and the Finnish power play drew blood on its second opportunity. Granlund centered it to Aho, who one-timed it past Bobrovsky’s glove at 5:34 to make it 1-1. On a mid-game power play, the Russians had Finland pinned down in their own zone, but the Finns, led by blueliner Atte Ohtamaa, blocked shots with grim determination. And Russia’s failure to capitalize proved fatal. Finland jumped into a 2-1 lead at 15:50 on a beautiful exchange between Jokinen and Laine. Jokinen took the puck below the goal line, fed it back to Laine, and then circled out in front of the goal to take the teenage dipsydoodler’s return feed, snapping the puck over the helpless Bobrovksy. Russia called its time-out with 3:43 left and Finland’s defenceman Juuso Hietanen heading to the penalty box for high-sticking. Bobrovsky quickly headed off for the extra attacker. There is some consolation for the hosts. Russia, which won four of the last eight World Championships (2008, 2009, 2012, 2014), still has a shot at capturing its eighth medal in the last 10 years in Sunday’s bronze game.